January 24, 2017 (Lemon Grove) -- In her 80 years, Janet Gastil has worn many hats and is a true Renaissance woman. She has been a wife and mother, teacher, musician, realtor, and politician. Her son, George, has followed in Janet’s footsteps, dedicating himself to teaching and public service, as well as raising his family. November 27, 2016 (Lemon Grove) — On election night, George Gastil held a lead over Racquel Vasquez in the Lemon Mayoral race. But by morning, Vasquez was on top. Her margin has now grown go 120 votes, close to 1%. January 12, 2016 (Lemon Grove) - There will be zero medical cannabis dispensaries in Lemon Grove if Ordinance #437 passes on the “second reading” of the bill at the next City council meeting on January 19th. July 5, 2013 (Lemon Grove)—On July 2, the Lemon Grove City Council decided to table a motion to support a Constitutional Amendment that would overturn the U.S. Supreme Court decision in Citizens v. Federal Elections Commission. The high court ruled in 2010 that corporations had a right to virtually unlimited campaign contributions. Allowing companies to inject massive amounts of money into the political system has led to some of the most expensive elections in American history. 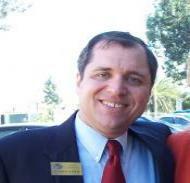 The effort was led by Councilmember George Gastil (photo). Before speakers from both Common Cause and Money out of Politics addressed the Council, Gastil went into some of the problems with the decision, which could ultimately impact municipalities such as Lemon Grove. 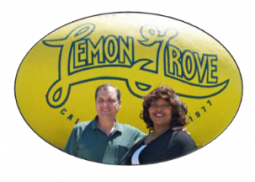 No vember 8, 2012 (Lemon Grove) – The election of Racquel Vasquez and reelection of George Gastil restores a Democratic majority to the Lemon Grove City Council. Vasquez won 29.30% of the votes cast, followed by Gastil with 23.01%. October 22, 2012 (Lemon Grove) – A week after receiving an endorsement from the Lemon Grove Firefighters, Local 2728, the San Diego Deputy Sherriff's Association has unanimously endorsed both Council Member George Gastil and City Council candidate Racquel Vasquez to fill the two open Lemon Grove City Council seats up for election this November 6. Gastil is seeking his second term on the City Council, while Vasquez, who currently serves as a City of Lemon Grove Planning Commissioner, is seeking her first. September 6, 2012 (Lemon Grove)--Council Member George Gastil and City Council candidate Racquel Vasquez will host a weekly meet and greet at the Lemon Grove Starbucks, 7801 Broadway, starting Saturday, September 8 at 9 a.m.
Each one-hour event will provide residents with the opportunity to meet the two San Diego Democratic Party endorsed candidates, ask questions about their individual campaign platforms, and enjoy a free cup of coffee. August 30, 2012 (San Diego’s East County) – Congresswoman Susan Davis and Congressman/Mayoral candidate Bob Filner were among the many candidates on hand last weekend for the grand opening of a Democratic Party campaign headquarters at 7839 University Ave., Suite 106, La Mesa. County Democratic Party Chairman Jess Durfee spoke of “fulfilling a promise” to help Democrats in East County. While much of East County remains solidly “red”, redistricting has shifted many communities in East County into Democratic districts and voter registration is increasingly favoring Democrats in some areas that have long been considered Republican strongholds. September 18,2011 (Lemon Grove) – The public is invited to witness history on Thursday, Sesptember 22 at 12:30 p.m. City, county and state officials will be on hand to announce details of the Main Street Promenade Redevelopment Project—and watch demolition of vacant buildings near the trolley station. 4) Completely eliminate the City’s Recreation Services Department—a move that could also end City-sponsored community events such as Concerts in the Park, Movie Night, and the annual holiday Bonfire. August 22, 2010 (El Cajon ) – Two Congressmen and four local lawmakers fielded questions from the audience Friday night, trading quips and barbs on topics ranging from healthcare to gay marriage. The occasion was the San Diego East County Chamber of Commerce’s annual “Politics in Paradise” event in the Water Conservation Garden at Cuyamaca College, where the weather was sultry and the politics even hotter. October 8, 2009 (Lemon Grove) – Community leaders gathered at the Masjid Usman-Center for Religious Tolerance in Lemon Grove on Saturday to honor Dr. Abdussattar “Sattar” Shaikh, co-founder of the Islamic Center of San Diego. State and city leaders as well as representatives from the Sheriff’s Department and San Diego State University all praised Shaikh’s leadership in fostering multi-cultural understanding and religious tolerance. “He has helped Muslims from all over the world form a thriving community, even in times of adversity,” said Lemon Grove Councilman George Gastil, who organized the event and issued a commendation on behalf of Lemon Grove. “We honor you, Dr. Shaikh, for the love and devotion you have shown to your adopted country. You have touched countless lives."